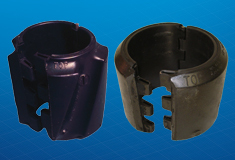 Regal™ Drill Pipe/Casing Protectors (DPPs) are steel-reinforced, molded-rubber pads that are installed around the O.D. of the drill pipe to provide an expendable, downhole wear surface between the casing I.D. and the drill string. The DPPs protect the I.D. of the casing from wear caused by the drill string. The most common applications are in deviated wells, deep holes, fast rotary speeds, under high torque and in offshore applications. Provides a sacrificial wear surface. Hinged can for easy installation. Top- and bottom -tapered shoulder. Fluted and slick designs available. NBR and XNBR compounds available.